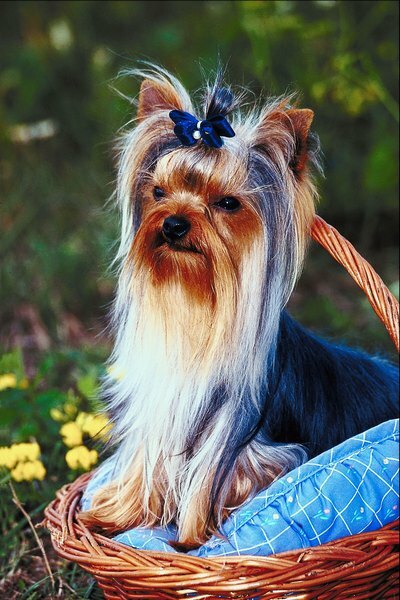 Keep your Yorkie's mane beautiful with natural rosemary. The Yorkie has a single layer of hair instead of layers of fur like other dogs. This makes conditioning the Yorkie’s coat a necessity. However, a conditioner that is too heavy may weigh the coat down and make it look thin. Therefore, consider making your own natural rosemary conditioner that is safe and has a nice aroma. Pour 4 cups of water in a medium pot and bring it to a boil over high heat. Add 2 teaspoons of fresh rosemary to the boiling water. Remove the pot from the heat and let it sit for at least 10 minutes. The steeping creates a rosemary tea. The tea provides a nice aroma and conditioning for the Yorkie's thin, fine coat. Strain the rosemary from the mixture using a towel draped over a colander. Catch the water and rosemary mixture in a clean bowl. Pour the mixture into a spray bottle after it cools. After washing your Yorkie, spay the rosemary conditioner over her coat. Since there is no oil in the conditioner, there is no need to rinse her. If fleas are an issue, add two drops of tea lemon oil to the spray bottle. Also, since this conditioner is safe for the Yorkie's fine hair, it is safe for most dogs. If your Yorkie has any itching or signs of a skin problem, consult your veterinarian. Do Yorkie Coats Grow Long?